As you drive along the A6175 from Clay Cross into North Wingfield the church is immediately ahead of you on top of Church Hill. The 100 feet high west tower is 15th century, and Perpendicular in style. Pevsner, writing about British architecture in the aftermath of the Second World War, rated the tower as the best piece of the church; he pointed out "the angle buttresses, two light bell-openings on each side, a frieze of shields above and then battlements". The sculpture of the Martyrdom of St. Lawrence, a "defaced relief" according to Pevsner, was discovered in 1860 when the south aisle was rebuilt. 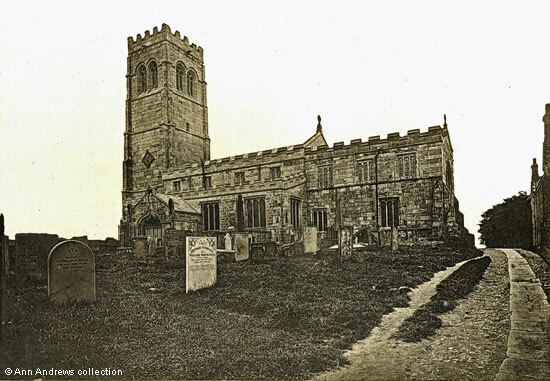 The clerestory windows and the north aisle were repaired in 1872. "1633. Upon the first day of August, or thereabouts, their [sic] was a great clock plum (weight) stolen out of the steeple, which was eight or nine stone in weight : some stronge body did steal yt, or else it could not have been carried away, for I could not lift it with one hand. ... The church was made common, and doors left open alnight manie times". "1633. The parish church steiple at North Wingfield white lymed in September". "1643. Ye chancell lead was bloane off at ye same time . . . . winde fortie yardes". "1718. This is to certifie whom it may concern, yt in ye year of our Lord 1718, the loft or gallery, in North Wingfield church was erected by the churchwardens of this parish, viz. :-John Lillyman, Thomas Clay, Ralph Wass, and Samuel Harrison, who, with ye unanimous consent of ye parish, for the defraying of ye charge of so good a work, sold such seats in ye aforesaid loft, as shall be hereafter mentioned to these several parties, to them and their heirs for ever". The hands of St. Lawrence's church clock show that the building was photographed at 10 to 4 in the afternoon, probably in 1875. What helps date the picture is a headstone in the foreground; two of them are easily readable when the image is enlarged, something which underlines the exceptional quality of early photographs. The ground in front of the white headstone for William Whitworth is covered with grass so one can also assume that he had not just been buried, although a slight mound is still visible. "We find, beneath a spout of the north aisle, the old massive font. On the occasion of our visits it was full of water, and was being used as a wash hand bason by the lads of the church school in their dinner hour. From the systematic way in which they went to work - soap even not being absent - it was obvious that this was the purpose to which it is generally applied. It is passing strange how the inhabitants of North Winfield have for so long suffered this ancient font to be defiled. In that rude bowl their forefathers have been christened eight hundred years". ... 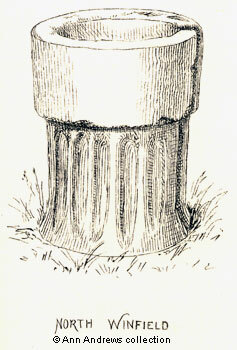 The font is of rude early construction, the base being channelled in flutings, and the whole of one block of coarse gritstone. ... The present font is an ugly octagon construction, quite out of keeping with the church, and bearing the date 1662". Cox later recorded that the children "barbarously treated" several early effigies of the Deincourts when, in addition to they times they were washing their hands, they were being educated at the day school held in the north chancel chapel. Several generations of the web mistress's direct Clay ancestors would have been baptised in both the older and the newer font. 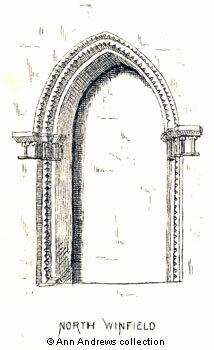 "At the east end of the north aisle is a Norman window, now blocked up which, if it was opened, would communicate with the chapel beyond, on the north side of the chancel. This is of the late Norman period, approaching the transition to the next style, and the arch is not perfectly semi-circular. It is enriched with some clear cut mouldings of the tooth or four leaf pattern, and the capitals of the side pillars are well worthy of attention, as they are a most unusual design, and might, if taken by themselves, be attributed even to the Saxon period. Its date, however, appears to be about the middle of the twelfth century, early in the reign of Henry II". In a later work, the same author described the design of this window as exceptional. In 1953 Pevsner thought this was the most interesting piece in the church. 1. Heliotype plate of "North Wingfield S", from a photograph taken specially for Cox's book by Mr. R. Keene of Derby and the plate by B. J. Edwards & Co..
2. The drawings of the font and the window were from drawings by Mr. Bailey and others (not named) and from plates produced by Bemrose of Derby. Cox, J Charles (1875) "Notes on the Churches of Derbyshire, Vol I, Hundred of Scarsdale", Chesterfield: Palmer and Edmunds, London: Bemrose and Sons, 10 Paternoster Buildings; and Derby. Cox provides more examples about the church fabric from the parish register than are quoted here; the 1833 quote is incomplete here and I have not included those from 1634 and 1650. Thomas Clay, mentioned in 1718, is not a direct ancestor, but is / was related. See Shirland for a little more about the Clay family. North Wingfield, Kelly's 1891 Directory. There is more about the church. Derbyshire's Parishes, 1811 includes a short piece about North Wingfield.